Situated on the West Bank of the Nile, 12 km south-east of Al-Ballyana, it was the chief center for worshipping the god Osiris. On the west bank of the Nile, 90 miles (145 km) north of Luxor, lies the Temple of Abydos. Abydos is linked to the earliest dynasties recorded, and in 1993, the earliest known tomb was found here, along with some of the oldest hieroglyphics ever discovered. 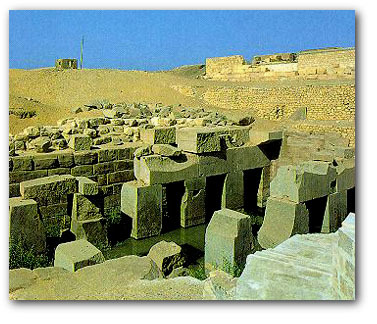 The Temple dates to around 3150 BC, and the records have provided scholars with much of what is known about the earliest periods of recorded history. This area, sacred to Osiris, was a very powerful location to those who believed in the next world. The ancient Egyptians said that at sunset, the area looked like a golden staircase leading to the afterlife, and thus many people wished to be buried here. It was here, too, that Osiris, after being killed by his brother Seth, returned to power. Seth had killed Osiris and scattered the pieces of his body all over Egypt. Osiris' wife and sister, Isis, gathered the pieces one by one, put them back together, and restored life to her husband. It was said that Abydos was where the final piece, his head, was buried, and so it was here that Osiris was brought back to life to become the judge of the dead and lord of the netherworld. The original Temple of Osiris was built by Seti I, who came to power 29 years after the collapse of the regime of Akhenaten. Seti wished to restore the beliefs in the traditional gods and so built this temple to show his devotion. 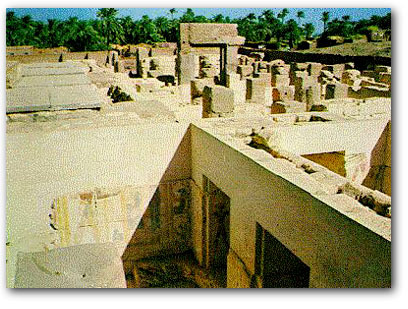 The way leading into the temple had two courts and a pylon, which were built by Ramesses II. The way these courts and pylon were positioned gave the entrance the illusion of sloping upwards. Sadly, this entrance has been mostly destroyed. The front of the temple is now 12 rectangular pillars, covered with sacred images welcoming Osiris, Isis, and Horus. The first (outer) hypostyle hall was built by Ramesses, but the quality of the decorations on the columns are not as impressive as those found in the second (inner) hall, which Seti built. It is widely thought that Ramesses used the best craftsmen in building his own temple, but used lower quality workers on this temple after the death of Seti. Just beyond the second hall are the seven separate sanctuaries dedicated to Seti I, Osiris, Isis, Horus, Amen, Mut, and Khensu. Originally, seven doors led to the sanctuaries, but Ramesses, for reasons still unknown, had all but one covered over. When the temple was in use, each of the sanctuaries would have contained the god's barque (sacred boat), and would have had a stele placed in front of a false door. The sanctuaries were locked and only the high priests of each god could enter, as the Egyptians believed that the gods actually lived inside their sanctuaries. The sanctuaries are highly decorated with bas-relief paintings dedicated to the several gods of the temple. Many of the bas-reliefs in the sanctuaries still have their coloring, but the best decorations are the masterful unpainted moldings. One scene in Seti's sanctuary shows him being crowned by the goddess of Upper and Lower Egypt, but by far the most incredible paintings are the ones found in Osiris' sanctuary. The temple also possesses a King's Gallery, a room that lists all over its walls the names of the gods along with over 70 of Seti's predecessors (minus some omitted for political reasons such as Akhenaten and Hatshepsut), making it an invaluable resource for historians. Through the rear door of the temple is the Osirieon, the only visible tomb at this site, which was built before the main temple. Much of the damage to the Osirieon has been from flooding, as it was built at water level, yet it is not much diminished. Red Aswan granite pillars, each weighing about a hundred tons apiece, support equally massive archways. This temple was built as a symbol of Seti's closeness to Osiris and contains a sarcophagus, though Seti was not buried here. 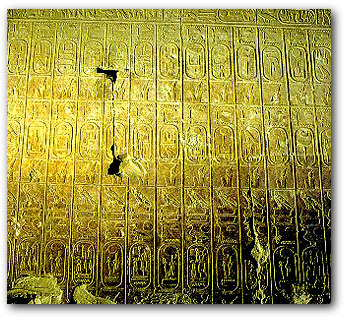 Seti's actual tomb is in the Valley of the Kings in Luxor. This was a fairly common practice among many of the pharaohs, having "public" tombs in one location, but actually being buried in another. The Osirieon is currently inaccessible because of the rising sand and the flooding that has occurred. Excavation has been done on the south side passage, which revealed texts from The Book of the Gates and The Book of What is in the Duat. 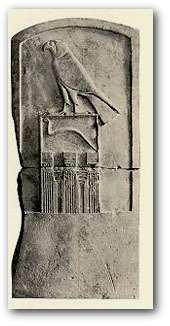 This section was begun by Seti and finished by his grandson, Merneptah. It is a complete tomb structure, all ready to receive the mummy of a king, yet it does not appear ever to have been used so. Abydos does have a reputation for these "false tombs" or cenotaphs. Some theorists state that Abydos does not even have a single actual tomb in it, but that all the dead who have tombs at Abydos are actually buried elsewhere. The cemeteries of northern Saqqara certainly have a great number of royal mastabas, of which many have been linked to the Archaic rulers. It is very possible that actual burials of kings and high-ranking officials were carried out at Saqqara, which is near Memphis, the new court city. Thus the monuments at Abydos are precisely that: monuments. It is fairly simple to see why this might be so. The rulers would no doubt have a desire to be buried near the place they ruled, but Abydos was also a powerful site because of its religious ties, as well as being deep in the ancient homelands. Thus, the rulers arranged to have themselves "buried" in both places. The body at Saqqara or another site, and a cenotaph built at Abydos. Of course, the reverse could be true, with Abydos as the true burial site and all the tombs at Saqqara are cenotaphs. Or perhaps the explanation involves a little bit of both, with some rulers desiring to be buried near Memphis, and others at Abydos, but each ruler building two tombs, one in each location. It would be rather unusual for the rulers to remain as visible as possible in their new capital during life, and then at death, simply passing from view. Thus much of the current consensus is that Saqqara is the actual burial site and that Abydos is the site of the royal monuments. The tombs at Saqqara as a whole are larger and more luxurious than those at Abydos (with the exception of the valley "temples" of Abydos which are immense and have no known Saqqaran counterparts), suggesting that Saqqara is the true burial site. Yet there are a large number of subsidiary tombs at Abydos, such as those used by officials of state, but very few at Saqqara. And Saqqara is the home of the most famous of the false tombs, the Third Dynasty step pyramid of Sekhemkhet, which remained sealed even to 1955, when the seals were pierced and it was discovered to have always been empty. It is a question that may not be easily resolved.